Welcome to a post with a bit of a difference. Normally I just post reviews of books that I have read, so it has been a while since I posted a Q&A on my blog. I’d just like to say thank you to David Barbaree for agreeing to do this Q&A and to Emily of Bonnier Zaffre for arranging it. None of the questions or answers in this Q&A have spoilers. I hope you enjoy it. In a darkened cell, a brutally deposed dictator lies crippled – deprived of his power, his freedom – and his eyes. On the edge of utter despair, his only companion is the young boy who brings him his meagre rations, a mere child who fears his own shadow. But to one who has held and lost the highest power, one thing alone is crystal clear: even emperors were mere children once. Ten years later, the new ruler’s son watches uneasily over his father’s empire. Wherever he looks rebellion is festering, and those closest to him have turned traitor once before. To this city in crisis comes a hugely wealthy senator from the very edge of the empire, a young and angry ward at his heels. He is witty but inscrutable, generous with his time and money to a leader in desperate need of a friend – and he wears a bandage over his blinded eyes. The fallen emperor’s name is Nero. But this isn’t his story. 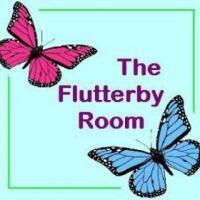 The Flutterby Room (TFR): Hey David, thanks for agreeing to stop by The Flutterby Room for a Q&A. DEPOSED is out on the 4 th May. It’s both your debut novel, and the first book in a trilogy. So my first question is, are you going to be doing anything to celebrate on publication day – or have you already celebrated? David Barbaree (DB): Hi Becki. Thanks for having me. It was exciting to land an agent and a publishing deal. But I think the biggest thrill was when I held the hardcopy in my hands. It finally felt real. After I’d admired it from every angle, my wife and I opened a bottle of wine to celebrate. TFR: How would you describe DEPOSED in ten words? DB: Fallen emperor, blinded and left for dead, seeks his revenge. TFR: From the blurb we know that DEPOSED is set in Ancient Rome, was there anything in particular that drew you to that empire rather than Greece or Sparta? DB: I’ve always been fascinated by ancient and medieval history. My love of Roman history in particular was cemented about ten years ago when I read John Julius Norwich’s series on the Byzantine Empire, which covers the later period of the Roman Empire. I worked backwards from there, to the earlier Imperial period and then the Republic. I’m not sure what it is about Rome that’s captured my attention. I’ve heard it said that it’s the combination of Rome’s similarities to our own time and the stark differences; how it’s both familiar and very foreign. I think that’s true. And everything is grander in Ancient Rome, the battles, the politics, the personalities. Also, the eight-year old in me will always love a good sword fight. TFR: Nero is perhaps one of the more famous Roman Emperors, and although the blurb says DEPOSED isn’t his story, he was obviously a starting point for you. What drew you to him? DB: I wanted to tell the story of a tyrant who, after he was deposed, blinded and left for dead, seeks his revenge. I’ve always loved the brutal protagonist the audience will reluctantly cheer for, like Walter White. Nero fit the bill. But he also had an artistic sensibility that didn’t really match the stories of the bloodthirsty hedonist. I think this made Nero more complicated and interesting than the commonly held view allows, and a compelling protagonist. TFR: As this is an alternate history, was there a lot of research involved writing DEPOSED? DB: You could call DEPOSED an alternative history. But I went to great lengths to exploit gaps in the historical record so that the story could be true. Obviously, it didn’t happen the way the book depicts, but the gaps were useful to me as a novelist. For example, the historical record from Vespasian’s reign (the emperor who eventually succeeded Nero) is sparse at best. I wanted the story to be not necessarily true but possible. So I spent a lot of time researching the period, and I did my best to make it an accurate, compelling recreation of Ancient Rome. TFR: How long did it take you to write DEPOSED – was it something you just sat down and churned out, or did the idea come to you gradually? DB: It took about 6 years in total. But at first I didn’t work on it fulltime. It began as a hobby. I’d re-write the opening chapters again and again, teaching myself to write. At the same time, I would research the period. Eventually it grew into an obsession. I wrote the last half of the book over about a three month span. TFR: You’re a lawyer, a busy job by all accounts; did you find it difficult to find them time to write? DB: Yes. But I found I could carve time out in the mornings before work. I didn’t mind getting up early because I enjoyed writing. TFR: And my final question is what are you reading right now? DB: I’m just finishing up Conclave by Robert Harris, which I’d highly recommend. It’s both a thriller and a fascinating procedural on how Pope’s are elected. Harris is exceptional at pacing a novel. David Barbaree is a lawyer and a graduate of the Curtis Brown Creative Writing School. He lives in Toronto with his wife and daughter. His debut novel DEPOSED is out on May 4th 2017. You can pre-order it on Amazon UK, Foyles or The Book Depository. Or add it to your Goodreads shelf.